As the ’90s closed, Bob Mould had officially had enough of himself—primarily the signature guitar-rock sound he pioneered as a member of Hüsker Dü in the ’80s, with his trio Sugar in the early ’90s, and as a solo artist. He made his fatigue clear with “I Hate Alternative Rock” and “Egøverride” on his 1996 self-titled album, but he stepped up the rhetoric with what would be his final album of the ’90s: The Last Dog And Pony Show. He was putting down his electric guitar to try something else. At the time, Mould was living in New York and getting involved with electronic music, a genre blissfully lacking in loud guitars. Mould, in his late 30s but still in the early days of living as an out gay man, finally felt free to express himself as he saw fit, audience expectations be damned. The album that followed, 2002’s Modulate, found him embracing electronics but not withholding his Stratocaster altogether. (That would be the EDM album he released under the name LoudBomb, an anagram of “Bob Mould.”) While several of the tracks could have fit on 1996’s Bob Mould, Modulate—and its accompanying tour—would be tremendously controversial for Mould’s fans and send the singer-songwriter back to his rock comfort zone a few years later. It shouldn’t have surprised Mould, but it did. During a one-off show in Chicago in September of 1999, he segued from the somber, Workbook-esque “High Fidelity” into “Sunset Safety Glass,” a four-on-the-floor dancefloor stomper awash in synthesizers. It landed with a thud. Chicago has long been Mould’s second hometown, a place where he could generally count on receptive audiences to trust him with new material, but this audience could only muster stunned, polite applause once the song finished. Mould was immediately irritated, grumbling as he prepared to perform another future Modulate track, the guitar-assisted “Semper Fi,” about not getting appreciation for the hard work he’d put into the music. The rest of the set stuck to his recent work or newer songs that fit more with his signature sound, but it didn’t bode well for Modulate. Bob Mould: It’s just all different tools. It’s like trying to pound a nail with a saw. It’s like you sit there and try to whack it with the side of the blade for a few years, and it might move a little bit, but if you’re used to using a hammer, you just hit it clean once. [Claps.] Yeah, it’s just different tools. It just wasn’t intuitive. Now, I understand the form a lot more. It’s funny though, ’cause I think I was on the right course. I just could have used a hand. The A.V. Club: You say later in the book that you knew you were on the right track when The Postal Service took off. BM: I mean, that was just months later. That and all the Morr Music stuff. I mean, Her Space Holiday was around then—they opened the tour, and that was a really good fit. Somebody who was trying to do the same kind of things. I mean, yeah, I think my intuition was right, but the execution wasn’t happening. It was rushed, and it was primitive. The difference is that Ben Gibbard released that Postal Service album with a collaborator (Jimmy Tamborello) and under a different name, two things Mould couldn’t lean on with Modulate. If the electronics on Modulate had been subtler, or played more of a supporting role (as they did on his first couple of post-Modulate albums), fan reaction probably would have been different. But Mould has always been artistically restless—his first solo album, Workbook, was a dramatic left turn from what preceded it—and unapologetic about his work. Working with a collaborator or using a different name didn’t occur to him, because this was what he wanted to do at the time. It just wasn’t what fans wanted from him. 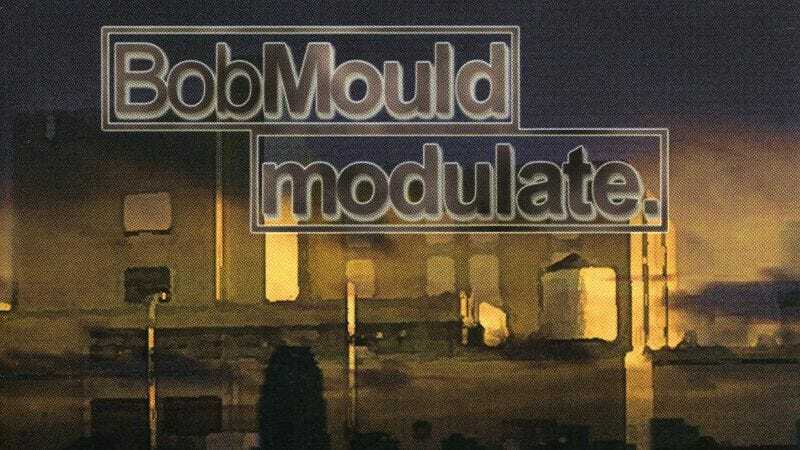 Fourteen years later, Modulate hasn’t aged into a great album, but neither is it a pox upon Mould’s discography. “Sunset Safety Glass” sounds like a late ’90s club song, hooky and highly melodic, but by no means bad. It won’t be on anyone’s “Best Of Bob Mould” playlist, but it’s not quite a footnote, either. The best artists struggle with their art—“Sunset Safety Glass” and Modulate capture that struggle.